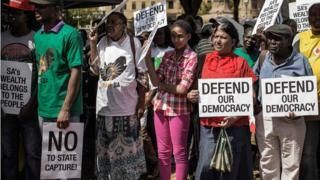 South Africa: Can President Zuma survive outcry over sacking? South African President Jacob Zuma's back is against the wall following his sacking of Finance Minister Pravin Gordhan at midnight on Thursday. The fallout from his comrades is unprecedented. His deputy, Cyril Ramaphosa, came out in public to say the president's decision to get rid of Mr Gordhan without consultation was "unacceptable". While the Secretary General of the governing African National Congress (ANC), Gwede Mantashe, said the list of ministers which Mr Zuma presented to the party leadership was compiled "elsewhere". A fellow KwaZulu Natal province comrade Zweli Mkhize, who runs the ANC's treasury, also came out against the president. "I have my reservations on the process followed and the manner in which this cabinet reshuffle was done," he said in a statement. But one of the major consequences for President Zuma since his controversial reshuffle is the call by his own allies from the South African Communist Party for him to resign. And so the domino effect starts. Mr Zuma's old allies in the trade unions are also considering a call for him to step down. Congress of South African Trade Unions (Cosatu) Secretary General Bheki Ntshalintshali said "the federation cannot ignore current political developments". There is no doubt that the knives are out for President Zuma. The question is whether all the protests and the public outcry will yield any results. Mr Ramaphosa, who is not known for his brevity, suddenly came out guns blazing over the weekend. "The events that are unfolding now, are not events that should make us scared. They are not events that should make us afraid of the future that beckons." And then he went further. "A moment of great renewal is upon us and we should not let it go by. We should grasp this nettle because that moment has arrived," said the man who helped write the country's constitution. "Let us act together in unity! Unite our movement, unite our country around one goal. "The goal of making South Africa great. The goal of making South Africa corruption-free. "The goal of making South Africa a South Africa we can all be proud of - and getting rid of greedy people, corrupt people within our land." You do not need to be a rocket scientist to figure out what the shrewd lawyer was saying here. This is a clarion call for the people to rise and support him. President Zuma's obituary has been written many times before only for him to rise from the ashes. Political analyst Dumisane Hlophe told me that Mr Zuma is unlikely to be removed. "He is not going down any time soon. In fact he may be in pole position. He has consolidated his power where decisions are taken within the party. In the ANC National Executive Committee (NEC). "The numbers within the NEC are what counts and in there he has considerable support." In its 23 years of freedom South Africa, which came with much promise when Nelson Mandela took over as the first black president in a post-apartheid world, finds itself at a crossroads yet again. The question is whether this time around, the people of Oliver Tambo, Walter Sisulu and Ruth First will cross the Rubicon. Video Is South Africa's ANC tearing itself apart?